Past cultural practices along the region of Wai‘alae to Kuli‘ou‘ou are generally associated with habitation, farming, fishing, gathering, religious activities and burials. During the early post contact period, this area was well-populated and several settlements, fishing villages and fishponds lined the coast. Here, areas along streams and springs were used for taro patches while other areas were used for dry land cultivation or pasture. Cultural practices associated with former fishponds in the region were significant prior to development of the area. Fishponds played an important role in Hawaiian culture, providing a definite supply of food. Hawaiian fishponds were usually constructed in estuaries where freshwater streams flowed into the ocean. In 1826, the missionary Levi Chamberlain took a tour of the island of O‘ahu, traveling through the southern coast of O‘ahu westward from Makapu‘u. He recorded a settlement of eighteen houses at Maunalua, with three additional settlements between Maunalua and Wai‘alae. These settlements were probably at Kuli‘ou‘ou, Niu and Wailupe. In 1828, Chamberlain made a second tour of southeastern O‘ahu, this time traveling eastward from Waikiki. He arrived at Wai‘alae, reporting a school with at least 30 scholars. The next stop was at Niu. “This place is rendered agreeable by a grove of cocoanut trees and a number of branching kou trees, among which stand the grass huts of the natives, having a cool appearance, overshadowed by the waving tops of the cocoanuts, among which the trade winds sweep unobstructed.” (Cultural Surveys) This is Niu. Niu literally means “coconut”; it was named for a woman who husked coconuts (He ‘o niu kana hana). Niu is variously described as an ‘ili in the ahupua‘a of Waikīkī or an ahupua‘a in the district of Kona. It extends from the border with Wailupe on the west to the border with Kuli‘ou‘ou on the east, and from the sea to the Ko‘olau Mountains. Niu is divided into two valleys, separated by Kūlepeamoa (flapping of chicken) Ridge. On the west is Pia (arrowroot) Valley and on the east is Kūpaua (upright clam) Valley. The two streams of these valleys merge into Niu Stream near the coast. This was the home of Alexander Adams. Kamehameha had awarded Adams control of over Niu Valley (much of which is still under the control on his descendants). It is part of a tract of 2,446-acres that was once a summer home of Kamehameha I and which later claimed by Alexander Adams under Claim No. 802 filed February 14, 1848, with the land commission at the time of the Great Māhele. He became an intimate friend and confidential advisor to King Kamehameha I, who entrusted to him the command of the king’s sandalwood fleet. He became the first regular pilot for the port of Honolulu. Captain Adams was sent to Kauai by Kamehameha I to remove the Russians from Fort Elizabeth that had been set up in 1817. His words reportedly were, “upon arriving they were soon dispatched”. Adams raised the Kingdom of Hawai‘i flag over the fort in October 1817. Adams stood on the shore with John Young at Kailua-Kona when the first American Christian missionaries anchored off shore on April 4, 1820. He helped convince the King to allow the missionaries to come ashore and take up residence in Hawaiʻi. When the HMS Blonde arrived in 1825, Adams helped the Scottish naturalist James Macrae distribute some plants he thought would be commercially successful in the tropical climate. Adams married three times, his first was to Sarah ‘Sally’ Davis, daughter of Isaac Davis; two of his wives were the Harbottle sisters (Sarah Harbottle and Charlotte Harbottle,) who were reared by Queen Kaʻahumanu and were favorites at court. According to his personal account, he was the father of 15 children, eight of whom were by his third wife. His estate in Niu Valley was held by his granddaughter Mary Lucas, who started subdividing it in the 1950s. The area created by the filling of Kūpapa Fishpond is now the site of numerous oceanfront homes. Niu Valley used to house the Dairyman’s (later known as Meadow Gold) dairy in the Niu Shopping Center area, and was the home of “Lani Moo,” their mascot. Most of Niu valley was dairy pasture with some small ranches and nurseries in the interior. Early Arabs and Europeans in the first half of the ninth century mentioned that travellers to China referred to the use of coir fiber and of toddy. Medieval writers called the coconut the Indian nut, a palm tree the frond of which produced a fruit as large as a man’s head. When the first Polynesians landed and settled in Hawaiʻi (about 1000 to 1200 AD (Kirch)) they brought with them shoots, roots, cuttings and seeds of various plants for food, cordage, medicine, fabric, containers, all of life’s vital needs. “Canoe crops” (Canoe Plants) is a term to describe the group of plants brought to Hawaiʻi by these early Polynesians. One of these was ‘niu,’ the coconut; they used it for food, cordage, etc. Hawai‘i is on the edge of the coconut belt. The coconut bears better nearer the equator, where it is more widely used than here. In Hawai`i there are other plants, native and introduced, that provide as well for people’s needs. The tree bears fruit around the seventh birthday, for up to 70-100 years, providing food for a human lifetime. There may be up to 50 fruit a year. A he‘e (octopus) was often planted in the bottom of the hole, furnishing fertilizer and giving the plant the idea of roots that spread and grip, and a body that is fat and round. As food, the niu flesh or meat is used for different purposes, depending upon the maturity of the nut. The jelly-like spoon meat of a green nut is called ‘o‘io. The next stage is haohao, when the shell is still white and the flesh soft and white. Half ripe, at the ho‘ilikole state, it is eaten raw with Hawai`i red salt and poi. At the o‘o stage, the nut is mature, but the husk not dried. The trunks used to make house posts, small canoes, hula drums, or food containers. Leaves (launiu) used to for baskets, thatch and for fans, known as some of the finest in Polynesia. Leaf sheaths used as food or fish-bait wrappers. Husk fibers also used for cordage to make nets or lashing, known as ‘aha; the cordage could be coarse or fine. The cordage can be made into supports for ‘umeke (bowls) or other round-based objects. In ancient Hawai‘i, fishponds were an integral part of the ahupua‘a. Hawaiians built enclosures in near shore waters to raise fish for their communities and families. It is believed these were first built around the fifteenth century. A fish was kapu to the Hawaiians during its spawning season, to allow a variety of fish to reproduce. Although the chief or commoners were unable to catch fish in the sea at specific time spans, they were available in the fishponds because fishponds were considered a part of the land. Its original owners were King Kamehameha I and Queen Kaʻahumanu who maintained a summer residence on Paikō Beach. Kalauhaʻihaʻi was once one of Oʻahu’s most thriving and productive fishponds, raising awa, aholehole, mullet and other favorites. The name Kalauhaʻihaʻi refers to Queen Kaʻahumanu’s breaking of the old kapu (the ancient system of laws and regulations) when she became Christian, which is said to have taken place on the property. 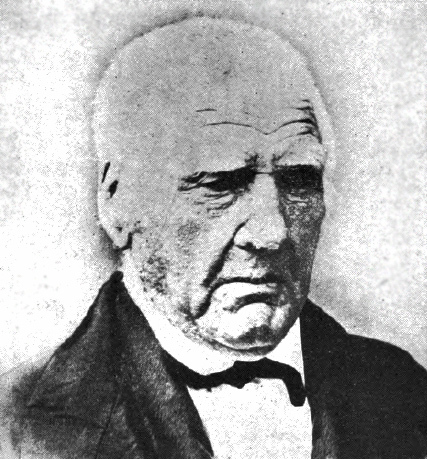 Ownership of the 2,446-acres were claimed by Alexander Adams under Claim No. 802 filed February 14, 1848, with the Land Commission at the time of the Great Māhele. The Niu Valley estate was passed down to Adams’ granddaughter, Mary Lucas; Kalauhaʻihaʻi fishpond was later used for a family dairy by Mary Lucas. She started subdividing the property in the 1950s; Adam’s descendants remain in the area. In the 1960s, Mr. Tad Hara had a two-story wooden house built over the still productive pond. The home was designed with a glass floor to allow Mr. Hara to view the fish in the pond. The 3-foot-deep pond was filled with aholehole (Hawaiian flagtail,) ʻopae lolo (aloha prawn,)ʻamaʻama (mullet,) awa (milkfish,) hapawai (brackish water snail) and koi. In 1989, Mr. Hara registered his fishpond with the State Water Commission. Widening Kalanianaʻole Highway (the fourth busiest highway in the State) in the early-1990s changed things. During construction, they ruptured the lava tube connecting Kalauhaʻihaʻi Fishpond to the underground artesian source directly mauka of the pond that altered spring flow to the ocean, diverted the water to utility line trenches and the sewer. A legal battle ensued to restore the spring’s flow; Mr. Hara eventually sold the property to the DOT. Since 2007, Maunalua Fishpond Heritage Center has been working to save Kalauhaʻihaʻi; they happily reported that on July 11, 2013, they were given the keys to the property and permission to restore the fishpond and care for the grounds. 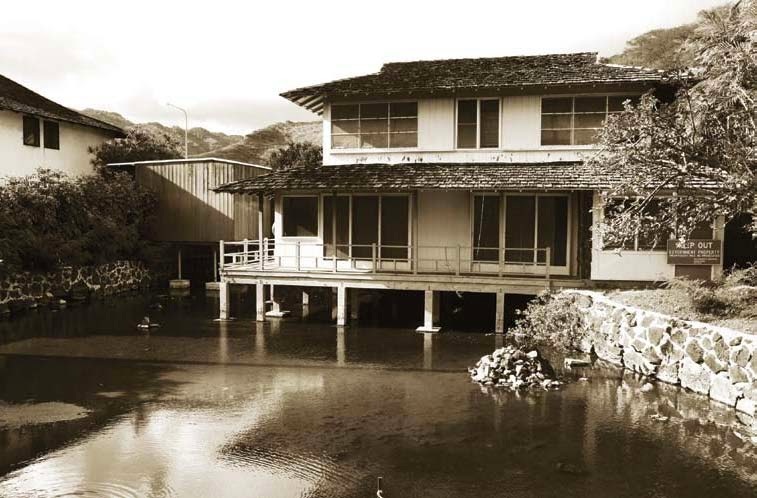 The image shows the Hara house and Kalauhaʻihaʻi Fishpond. In addition, I have added other related images in a folder of like name in the Photos section on my Facebook and Google+ pages.